Condition Report: Overall excellent condition, the dial and hands are mint. The case is in overall excellent condition. NOTES: The Breitling 817, which were all manufactured in 1975 and only for military issue, is a CP-1 model, 'Cronometro da Poslo' or chronograph issued to the Italian Army. The E.I on the back stands for Esercito Italiano, which translated to Italian Army. Only 500pcs were made and all individually numbered making these military chronographs very rare. An interesting story is that recent batch of 40pcs, which was was auctioned off, was issued to the elite 'paracadutisti' or paratrooper division. The 185 Regimento Paracadutisti R.A.O. 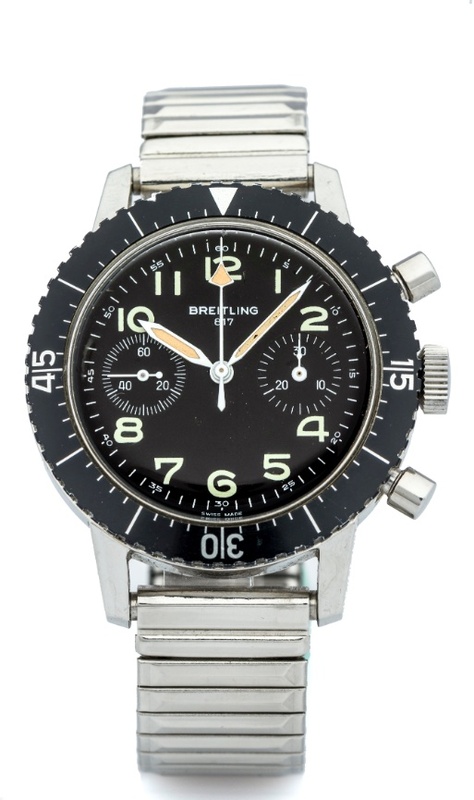 "Folgore" (185th Paratroopers Division Folgore) auctioned off their last remaining 40pcs of Breitling 817 chronographs and this watch is one of them and comes with a copy of the list in which it is included. We are calling these the 'Folgore Forty'.